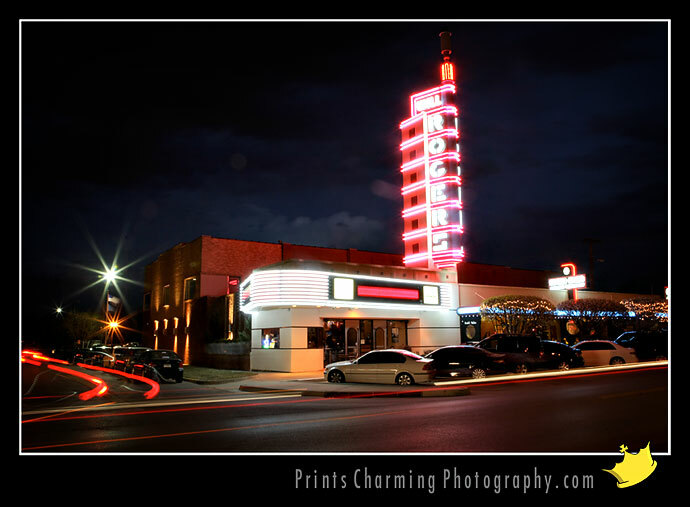 Today the Will Rogers Theater was outfitted with brand spanking new neon signs! It was no small job, as you can see from the photo below. I was honored to be asked to photograph the facility for use on websites, brochures, etc. Camera settings: 8 second exposure @ 24mm, F22, 200 ISO. No Photoshop retouching was needed. It’s really tough to hold a camera perfectly still for 10 seconds, so I was happy to use our new manfrotto tripod with the quick-release grip head. It’s perfect for people like me who don’t normally use a tripod and like to be able to move the camera wherever easily. In other news… It’s great to have our 2nd cinema display back from the Apple store and as good as new. It was slowly growing a dark patch like a beard across the bottom of the screen and it was time for a shave, so to speak. Now we have to catch up due to the lost productivity. =) There’s never really a good time for things like that no matter how you try to plan for them. Hope everyone enjoyed the absolutely wonderful weather today here in central Oklahoma! Apologies to everyone still enjoying winter up North. =) Have a great weekend! !